Marketing Vs Design – which matters more? This is the question we are posing on Wednesday 2nd November as part of our next BookMachine design event. We all know that both design and marketing are integral to making and selling the best books but all too often the two disciplines are kept very separate within publishing organisations. This fun evening aims to discuss the importance of both and highlight ways in which we can all collaborate more throughout the whole publication process. If you work in book marketing, your focus is on running campaigns to sell more books. If you are a designer you know that no one will read a blurb, or download a sample without eye-catching covers and advertising material. So which matters more? 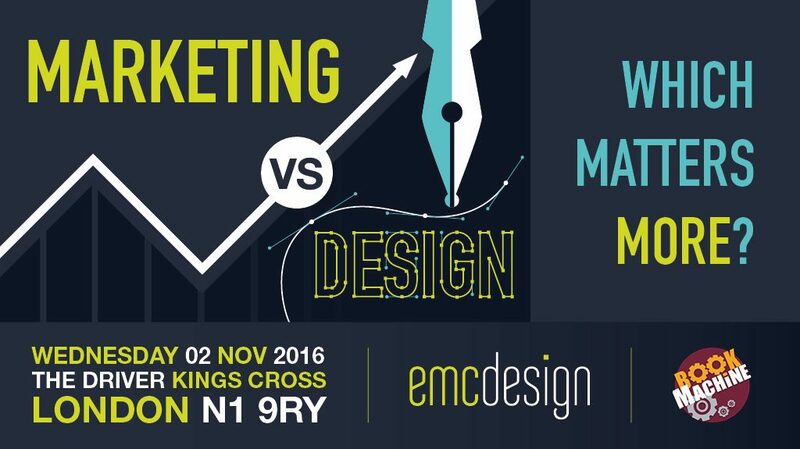 Join this fun debate around the importance of both marketing and design in the publishing process. Learn how top marketers and designers think, and reflect on how these insights can help you to sell more books. Each speaker has prepared a ten minute presentation on which matters more to them. They will include examples from their careers to illustrate their points and inspire you to think a little bit differently. EMC Design clients get complimentary tickets so email sophie@emcdesign.org.uk if your invite has gone missing, we hope you can join us for the evening. To book your ticket visit the BookMachine site here.